Is it "stuffing" or "dressing"? technically the latter is the correct term if it's cooked outside the bird; however, since "dressing" is so closely associated with salad dressing, I just prefer to call it all stuffing. Regardless of where it's cooked--and I recommend outside the bird for food safety reasons--it's one of Thanksgiving's most delicious and versatile dishes. The foundation of a good stuffing is sautéed aromatic vegetables (usually onion and often celery), dry bread (of course), maybe some protein such as sausage or bacon and liquid, usually a stock. After that, you've got a lot of room to build in the flavors you really like. I love to experiment with stuffing, as shown by the mix of recipes below. Classic 11-Ingredient Stuffing. Here's a good place to start if you've never made stuffing from scratch before. The only way to make stuffing easier is to go the boxed route (which I don't recommend). Fresh sage and dried thyme flavor this simple mixture of onion, celery and sourdough bread cubes. 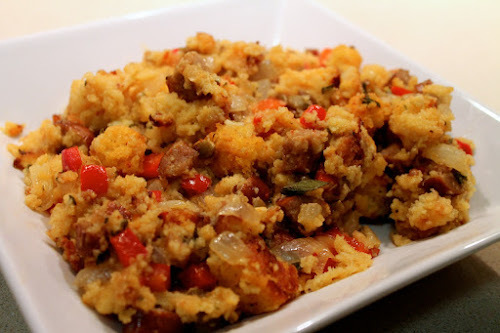 Sausage Cornbread Stuffing. 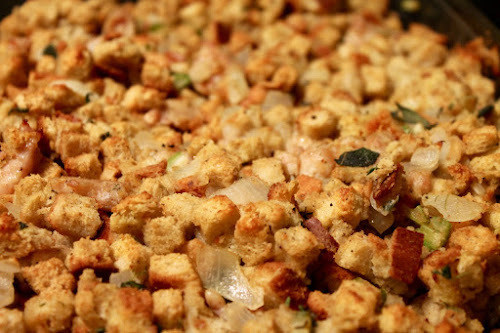 This is my favorite traditional stuffing--basically my go-to almost every Thanksgiving. It's similar to the Classic 11-Ingredient Stuffing except made with cornbread, although I like to mix it up with dried cranberries sometimes. 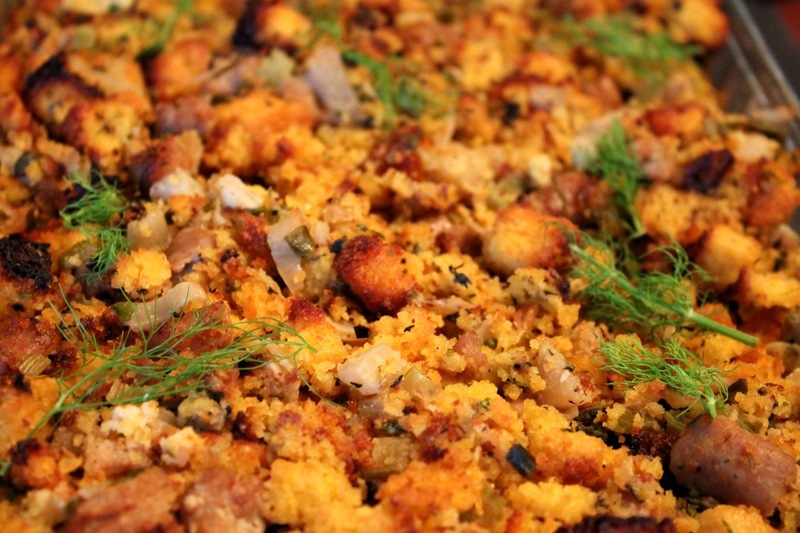 Cornbread Stuffing with Sausage and Fennel (pictured above). Another cornbread stuffing variation--this one I found in Bon Appétit magazine. In addition to the fennel, scallions, pear, marjoram and white wine make this an interesting and flavorful stuffing. Rye Bread Stuffing. I usually make stuffing with some kind of white bread, if I'm not using cornbread, but with this recipe I decided to see what rye bread would be like. There's bacon and apple in this one too. Italian Stuffing. I told you there were a lot of possibilities for variation with stuffings. This one looks to Italy with Italian bread, pine nuts, pancetta, fennel and dried figs. Southwestern Cornbread Stuffing (pictured above). Stuffing is usually pretty mild, but with this version I gave it a spicy kick with chorizo and chipotles in adobe. Don't forget to include the pepitas (pumpkin seeds) in this stuffing. Oregon Stuffing. Wanting something that nods to my childhood state, this one includes sourdough, hazelnuts, apple, dried blueberries and Oregon beer. Asian Grain Stuffing. Not into bread? Use whole grains instead. Here, brown rice mixes with sausage, onion, celery, carrot, shiitakes, ginger, soy sauce, rice vinegar and red chili pepper flakes for a dish with subtle Asian flavor.